Lucknow, 04 Oct 2018 [Fik/News Sources]: Police officials in Baghpat district of western Uttar Pradesh have assured family members of a young man alleged to have been murdered that a “just probe” would be carried out into the matter, after 13 of them changed their religion to Hinduism as a protest. Additional Superintendent of Police, Rajesh Kumar Srivastava, visited the village after news emerged that 13 members of a Muslim family had converted, alleging “unfair investigation” by the police. Srivastava told IANS that he had met the family members to assure them of a “free and fair probe”, which he said was still underway. “The decision to change their religion was their own and the police has nothing to do with it,” he added. The family members alleged that the body of the young man, aged 22, was found in a shop on July 22 this year and that he had been murdered, although the police refused to accept this and had closed the case calling it a suicide. The 13 family members of the deceased had given affidavits to the sub-divisional magistrate (SDM) of Badaut informing the district administration of their “wilful changing of religion”, a district official told IANS. 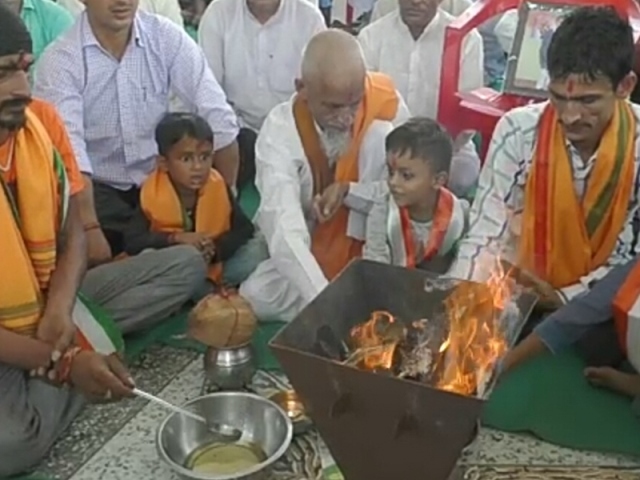 They also participated in a special ‘havan’, changing there names to Hindu ones, the official, who did not want to be named, said. All 13 are from Niwada village’s Khubbipura locality. During the conversion rituals, Hindu Yuva Vahini office- bearers were present. Some family members alleged that they were forced to convert by the Vahini members. The Vahini was founded in April 2002, on Ram Navami day by Yogi Adityanath, the present chief minister of Uttar Pradesh.